Teachers are professionals. Their professional learning needs to reflect that. Earlier this summer, as I started to think about what treating teachers as professionals actually looks like, I began toying with the idea of teacher-driven trainings. What if, instead of telling teachers what they were going to learn about, I presented them with a set of digital tools that would work in their content area, and let them choose what they learned? Are teachers capable of making such a decision for themselves? I decided they were, so I developed a structure that worked quite well for my four 3.5 hour sessions. I certainly don't have everything ironed out yet, but I'm pleased with the initial results. Here's the flow of each session, and at the bottom are links to the sites that I built to keep everything organized and on track. Teachers start by posting to Padlet how they're already using (or not using) technology to teach their content. Briefly (and informally) have a conversation about their posts and the tools they're using, validate the work they're doing with technology, and start making connections between what they already do and some of the tools they would see during the session. Introduce the agenda, and be prepared for people not to believe that they're actually going to get to choose what they learn. Using Nearpod, present brief summaries of the digital tools they can choose from. This also included some poll questions about people's technological comfort level and the occasional quiz question to get the engagement up. Start with the tool that got the most votes. Model and walk through its main features (10-15 minutes), clarify any confusion, then give 15-20 minutes of "sandbox time" for teachers to explore, talk, and start brainstorming ideas of how they can use it for instruction. Lather, rinse, repeat with the next two or three tools. Send everyone to a Google Slides presentation and give them 15 minutes to fill out their grade level, content, TEKS (state standard) and a tool they could use to enhance how they teach that concept. Everyone gets 40 seconds to share their idea as their slide is shown on the screen. Fill out a Forms survey for feedback. That's it. Nothing terribly earth-shattering, just a training based on the fact that since teachers are the gatekeepers of their classroom, they should have a say in what tools they are going to use. The best part of the whole thing was during sandbox time when I got to walk around and just talk to people. One anatomy and physiology teacher mentioned that they didn't have many online resources, so I was able to introduce her to BioDigital Human. My Friday afternoon group liked Nearpod so much that they asked if I could train them on that before we got into the science tools. Absolutely! The main issue I'm still facing is how to engage the intentionally disengaged. If you're going to walk across the room to start planning schedules and lessons with your grade level partner (yes, I saw you...), there's really not much I can do to stop you. You're a grown person. Maybe it should be a reflection piece for me that I didn't have something that you felt you could use. I'm still thinking through it. But even with the occasional rudeness and network complications, I'm motivated by the feedback* from the exit surveys. It's especially flattering when teachers who don't even teach a content area come back for another session because they felt they learned so much in their first one. To me, that speaks volumes. 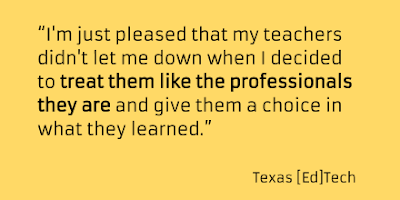 I'm just pleased that my teachers didn't let me down when I decided to treat them like the professionals they are and give them a choice in what they learned.